Between the Lines of the Vienna Convention? 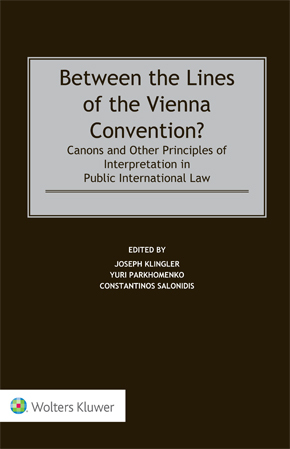 is a uniquely useful handbook that analyses certain particularly recognizable canons and principles of interpretation that are not expressly codified in the Vienna Convention, but that are arguably still authorized ‘between the lines’. This volume represents the first modern, freestanding analysis of such canons and principles, their utility in public international law, their role in treaty interpretation and their relationship with the Vienna Convention regime. the application of numerous individual canons and interpretive principles, including effet utile, expressio unius, lex specialis, ejusdem generis, in dubio mitius, in pari materia, ex abundante cautela, the principles of contemporaneity and evolutive interpretation and more. Extensive analysis of case law and scholarship provides insightful interpretive guidance across virtually every subfield of public international law. With its valuable insights into when the application of particular canons or principles of interpretation is most likely to be appropriate and persuasive, the volume will be of great value to lawyers representing parties (whether states, corporations or individuals) before international dispute resolution bodies, as well as to judges and arbitrators, legal officials at ministries of foreign affairs and scholars of public international law. Compliance with Domestic Law: An Implied Condition in Treaties Conferring Rights and Protections on Foreign Nationals and Their Property?